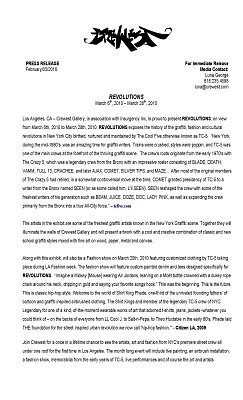 Los Angeles, CA – Crewest Gallery, in association with Insurgency Inc, is proud to present REVOLUTIONS, on view from March 6th, 2010 to March 28th, 2010. 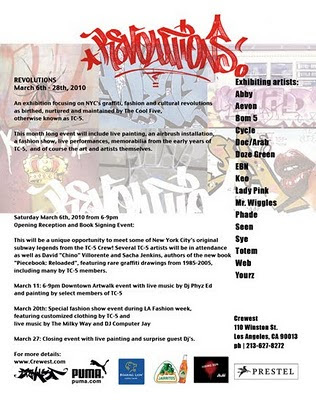 The artists in the exhibit are some of the freshest graffiti artists known in the New York Graffiti scene. Together they will illuminate the walls of Crewest Gallery and will present artwork with a cool and creative combination of classic and new school graffiti styles mixed with fine art. Join Crewest for a once in a lifetime chance to see the artists, art and fashion from NYC’s premiere street crew all under one roof for the first time in Los Angeles. 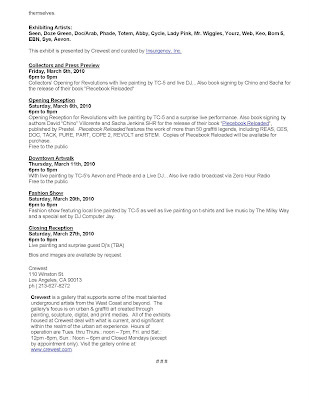 The month long event will include live painting, an airbrush installation, a fashion show, memorabilia from the early years of TC-5, live performances and of course the art and artists themselves. Seen, Doze Green, Doc/Arab, Phade, Totem, Abby, Cycle, Lady Pink, Mr. Wiggles, Yourz, Web, Keo, Bom 5, EBN, Sye, Aevon. 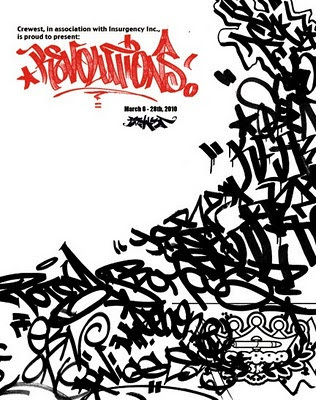 Opening Reception for Revolutions with live painting by TC-5 and book signing for release of the book “Piecebook:Reloaded” published by Prestel featuring many of the Tc-5 members in this exhibition. With live painting by TC-5’s Aevon and Phade with live music. Fashion show featuring local line painted by TC-5 as well as live painting on t-shirts and live music by The Milky Way and a special set by DJ Computer Jay.